The market went more or less sideways for the week. But it will take more than that to keep the rally going. 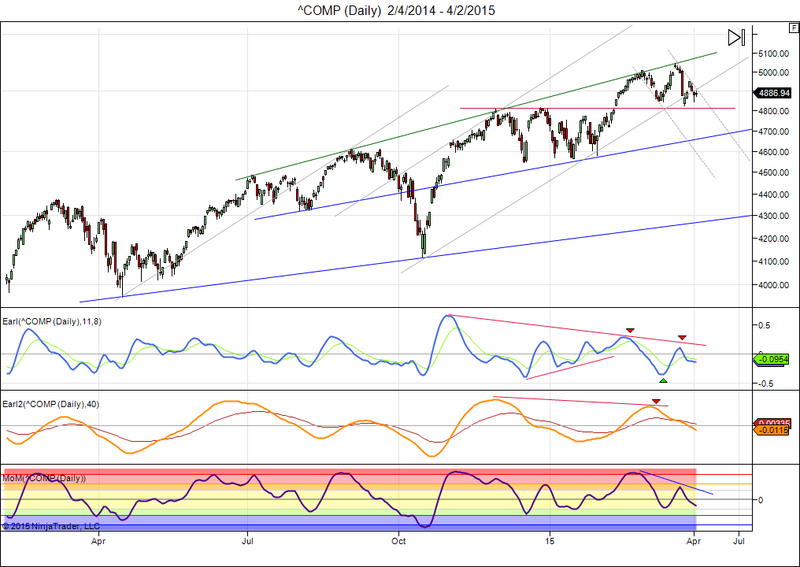 The Nasdaq remains at risk of dropping below 4800, which is now a major support level. If that happens a bottom around 4700 becomes the best case scenario, but it could also get worse. Readers of this blog know that I am not in the habit of spreading crash warnings and bubble notifications every other week. In the recent years I have frequently debunked “parabolic peak” warnings and other nonsense, as I did in this post. But that doesn’t mean the alarmists will always be wrong. Sooner or later it will rain. We will be starting a new lunar green period later this week, but it is quite possible that it will be a very weak period, as I pointed out last week. As you can see on our lunar cycle tracking page, which is updated at the end of each lunar period, the lunar green and red periods have a perfect record so far this year, three green periods were up and three red periods were down. 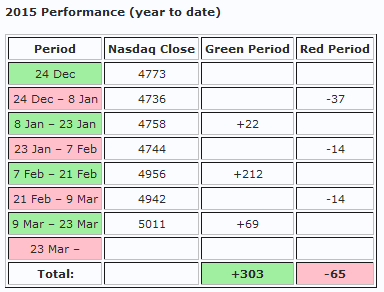 The current red period is down over 100 points with a few days to go, so probably the lunar cycles will go 7 for 7. That’s well above the historic norm, so we are more than due for a miss. It could come as early as the next green period. There is now too much risk for a serious inversion of the cycle, so I am keeping my powder dry. This entry was posted on April 6, 2015 at 11:44 am	and is filed under Financial Astrology, Market Commentary. Tagged: inversion, lunar cycles. You can follow any responses to this entry through the RSS 2.0 feed. You can leave a response, or trackback from your own site.